Crunching into a melting piece of ice is the most satisfying moment for me these days. The crunch takes on the same appeal as an accomplishment and the cool is this internal reward of both temperature control and hydration. My teeth are not terribly happy with me, but who cares? It is so worth it! As my dentist and husband have pointed out they see no reason why I shouldn’t just have a tall glass of cold water instead, but I have tried to explain that it is beyond the cool. It is the CRUNCH. The crunch is the most essential part of the entire experience. Clearly, pregnancy does some weird things to a body, but ice obsession? That’s a weird one. I can’t stop eating it… I thought at first it was a coolant tactic; because I am so internally warm I needed a way to cool down. With Iza’s pregnancy I was obsessed with frozen peas, so naturally, ice would just be a replacement now that I can’t get organic sweet peas so readily. What is the cause? After searching around the internet it looks like I am not the only one who is obsessed with or questioning why they are so enthralled by cold, crunchy ice. The most probable is a disorder called pica. Other causes could be an iron deficiency and if focused on ice only it could mean that you are trying to self-soothe. Pica is the act of eating non-food items like dirt, ice, and paint which have no nutritional value. Outside of pregnancy it is a serious issue and is likely related to a mental health disorder such as a compulsive, obsessive behavior. Inside of pregnancy, it can be your bodies way of begging for a different kind of nutrition that is being offered. Pica is a serious disorder and should not be taken lightly. If you are pregnant, however, pica is likely a temporary disorder that will disappear after birth. Tovolo 15 cube grid and fill each cube with water by about 1/8″. They harden a little thicker than the liquid at about 1/6″ and offer the absolute perfect bite every time without it melting in the process. Want something a little more fun? I sometimes do this with orange juice or mashed strawberries to get a little extra flavor in there. Its so delicious! 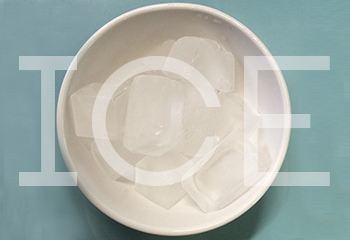 The idea of crunching on ice is one that our parents have told us not to do since we were little. But as a 37 weeks pregnant person with a toddler who likes to mimic everything I do, there is little I can do to control her from crunching ice. I am a terrible parent letting her have at it with a big bowl of ice! Her poor little teeth. So last week we were in the car and driving to a friends house. I had a metal coffee mug filled with ice and happily crunching as we were driving. Iza starts singing, “Yo quiero ice” (which means I want ice) over and over again as a song. I started handing them back to her one by one every time she sang since I couldn’t really watch what she was doing. I could hear her crunching occasionally, though so I just assumed they were all going into her mouth. Finally, there was a tremendous scream from her which nearly made me go right off the road. She started to cry and said that the ice is “no esta aqui” (which means was no longer in her hand). She had been saving them and as she was they were melting away in her sweaty sweaty palm and then falling down into her chair. She was soaking wet and without any satisfying crunch. Once I figured this out I had a chuckle.